Scratch the surface of Hong Kong’s creative scene and you’re bound to come across something that Leung is involved in. There’s HK Honey, the urban beekeeping project he founded two years ago; Shanghai Street Studios, which runs art, design and cultural initiatives in Yau Ma Tei; HK Farm, an experiment in rooftop agriculture; 2 Years Ahead, a publishing and furniture-building project. And that doesn’t even begin to cover Leung’s freelance work or his teaching at the Polytechnic University’s School of Design, where he will lecture on “design for the Asian lifestyle” in November. Leung is 28, with a shaved head and photogenic features. On a blustery day in late September he is dressed in grey shorts, worn pink slip-ons and a Ngau Tau Kok graphic t-shirt made by his friends at Start from Zero, the street art crew whose studio is just down the street. 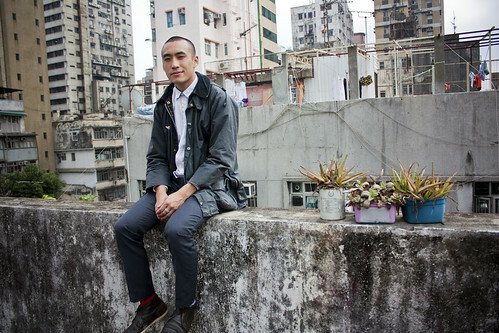 It has been three years since Leung left his native London, where he had been working as a product designer for Motorola, to study for a Master of Design degree at PolyU. When he arrived, he realised that Hong Kong lacked much socially-conscious design, so for his final project he created HK Honey, an attempt to bridge Hong Kong’s rural beekeeping culture with the urban reality of most of the city’s residents. Leung didn’t know anything about bees — “I used to be really scared of them,” he says — so he contacted Yip Ki-hok, a lifelong beekeeper who runs an apiary in Shatin. Yip taught him how to manage a hive and collect honey and beeswax, and Leung began to install hives on rooftops around the city. He also packaged Yip’s honey in elegant glass bottles sealed with beeswax, which could be turned into candles when the honey ran out, and sold them at design shops like Kapok in Wan Chai. Leung now has 26 bee stings to show for his work. “I keep count,” he says. Meanwhile, Leung rented an old tong lau flat on Shanghai Street, complete with decades-old furniture and wood partitions, and he began working with photographer Martin Cheung to document the life and culture of Yau Ma Tei. For one of his early projects, Leung and Cheung sifted through unclaimed photos from a local photo developer, collecting enough to create a surprisingly intimate and evocative peek into neighbourhood life. Candlemaking workshop in Shanghai Street Studios. Lately, HK Farm has been taking up much of Leung’s attention. Walking past rows of homemade wooden containers, Leung points out the latest crops. “Here’s some okra,” he says. “The sweet basil is doing really well because of the bees, which pollinate it.” The project is mostly educational in scope: school groups often visit the roof to learn about the potential of urban agriculture, and sometimes more basic things, like the relationship between bees and plants. It’s also a model of community participation. “We fertilise it with local food scraps from the dai pai dong and factory canteens,” says Leung. “One of them even delivers it to us.” Soil comes from Mapopo Farm in Fanling, and since it is clay-based and prone to hardening, it is loosened with rice husks from Hong Kong’s last remaining de-husking plant. “That place is really important for local agriculture,” he says, especially for the group of post-80s activists in Choi Yuen Tsuen who are trying to reintroduce rice-growing to Hong Kong. Leung is a media darling of sorts, with glowing coverage in local Chinese and English press, and his work is drawing international attention, too. HK Honey and HK Farm are taking part in Hong Kong’s exhibition at the Venice Biennale of Architecture, the world’s most high-profile showcase of architecture and urban design. Leung was also invited to speak at Design East, a cutting-edge design festival held last month in Osaka. It was a chance for him to boost his profile, but it also gave him an opportunity to step back and take stock of his many projects. Leung says he has run into a bit of a roadblock because, although he speaks Cantonese, he cannot read Chinese, which prevents him from fully delving into the social issues with which he is concerned. “Connecting with landlords in Kwun Tong or local schools, things where I might need to approach them in writing — that’s where I feel a communication barrier,” he says. He also wants to refocus his efforts on his social mission, with less emphasis on selling expensive HK Honey products. One bottle of honey sells for HK$240, most of which goes to support the project’s free workshops, tours and other initiatives. “When people buy the honey, it’s almost like an ethical quick fix, because they can feel good about buying something local,” says Leung. A better solution is to give consumers first-hand experience with the origin of their products. “You can buy a clean-burning candle from Kapok or you can come up onto the rooftop, see where the wax comes from and make a candle yourself,” he says. For that reason, HK Farm recently turned down an invitation to participate in the recently-launched Island East organic farmer’s market. Selling their produce from a stall in Taikoo Shing only reinforces the disconnect between the consumer and the food’s origin, Leung says. That doesn’t mean a retreat from the public eye, though. 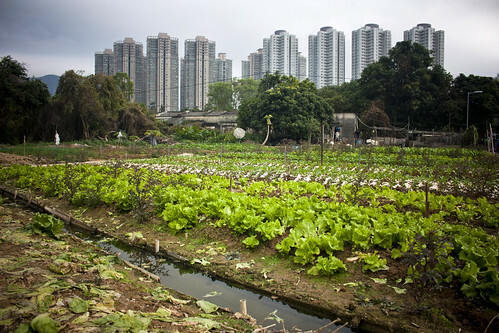 HK Farm was recently approached to open a rooftop farm on a new government-run building. The details still haven’t been made public, but Leung is working to overcome the government’s resistance to things like composting. This entry was written by Christopher DeWolf , posted on Thursday October 25 2012at 07:10 pm , filed under Art and Design, Asia Pacific, Environment, Heritage and Preservation, Society and Culture and tagged Beekeeping, Community, Farms, Hong Kong, Kowloon, Michael Leung, Rooftops, Social Design, Urban Agriculture, Urban Ecology . Bookmark the permalink . Post a comment below or leave a trackback: Trackback URL.